New professional painting company serves Winter Garden, Ocoee, Clermont, Apopka, Celebration and the surrounding communities. After Rich Emery had a great experience having his local Fresh Coat Painters company paint his home, he saw a perfect opportunity to expand that service to other communities. 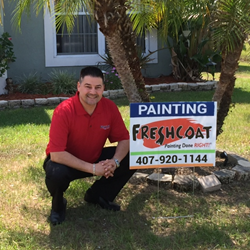 Now Rich is proud to announce that he’s opened his own Fresh Coat Painters franchise in Winter Garden. Fresh Coat of Winter Garden offers residential and commercial painting services including interior and exterior painting, wood staining and finishing, decks and fences as well as services for nearly every protective coating application. They use quality, environmentally safe materials, online scheduling, in-home color design consultations and detailed guaranteed quotes. Fresh Coat is licensed, bonded and insured so that customers can feel at ease with their decision. Fresh Coat of Winter Garden serves Winter Garden, Ocoee, Clermont, Apopka, Celebration and the surrounding communities. “I opted for a government job after serving 15 years in the United States Navy, but I always saw that as a transitional step. I heard about Fresh Coat Painters when I needed a painter about a two years ago and I was impressed with the company. My dad, Dave, spent 30 years in real estate and together we spent a lot of time freshening up the homes he was selling, mostly with painting. I know what it takes to do a painting job right and the challenges people face when working with some contractors. I opened this business because I saw an opportunity to offer a great service and an even better customer experience,” Emery said. In addition to using Sherwin-Williams® products, Fresh Coat of Winter Garden offers a 3-3-3 customer service pledge, so calls will be answered by a live person within three minutes, a quote will be delivered within three days (customer schedule permitting) and the job will be started within three weeks. The company also has a specially-designed quoting software that allows Fresh Coat to offer price quotes rather than just estimates. “I don’t see our clients as just families purchasing a one-time service – I see them as people we want to build a relationship with by providing a great experience. Part of that experience includes our exact quotes. When you get a quote from Fresh Coat of Winter Garden, you’ll have an exact breakdown of the proposed job and what each piece is going to cost. When you have that information, you can make informed decisions about what suits your needs, your wants and your budget. Once you decide what you want to do, we’ll get together to create a custom plan,” Emery said. Rich is a United States Navy veteran with 15 years combined service who sets aside time to coach community youth in various sports and work with multiple organizations, including veteran service groups. When he’s not working, he enjoys spending time with his own family. For more information about Fresh Coat of Winter Garden, call 407-920-1144, email remery(at)freshcoatpainters(dot)com or visit http://www.freshcoatwintergarden.com. With more than 120 locations nationwide, Fresh Coat Painters brings quality customer service, top-notch painting products, professionalism and affordable pricing to the residential and commercial painting industry. They use quality, environmentally safe materials, online scheduling, in-home color design consultations, and detailed quotes. All painters are bonded and insured employees. For more information, visit http://www.freshcoatpainters.com, call 1-855-FRESH-COAT or visit us on Facebook and Google+.